Want to take the edge off a kid’s rough day? Try Hug in a Mug’s cocoa! Combine milk and half&half in deep saucepan. Heat over medium-high burner, stirring constantly. Do not boil the milk! 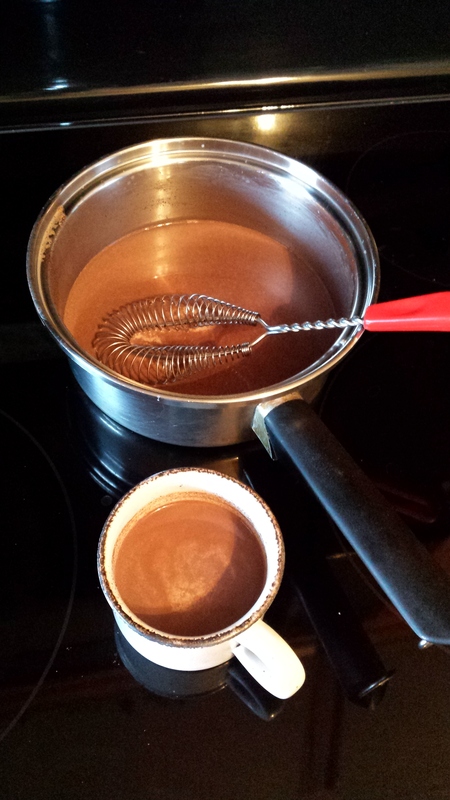 When the milk is warm/hot, add chocolate chips slowly, whisking constantly. Add all chips, keep whisking until chips have melted. Note: you’ll see tiny flakes of chocolate suspended in the milk. This is normal. It makes the cocoa awesome. Add vanilla and cinnamon once chips have melted. Stir for 1 more minute. For extra flair, add dollop of whip cream. Blow on hot liquid. Sip. Enjoy the awesome. Repeat.